After placing sixth and seventh in the Iowa straw poll, Rick Perry and Mitt Romney have dominated the Republican field of Presidential candidates. The former Governors have focused almost exclusively on each other in the last two debates. As for Republican bona fides, they each have a well-polished resume. Perry is a career politician. In 1984 he was elected to the Texas legislature. He has served as Agriculture Commissioner, Lieutenant Governor, and Governor of the Lone Star State. Perry took over as Governor when George Bush left to become President. He since won three consecutive terms, making him the longest serving Texas Governor. Mitt Romney took another route to his current position. Starting as a consultant with Bain & Company in 1977, he soon co-founded Bain Capital, which started with fewer than ten employees. Romney lost a bid for U.S. Senate to Ted Kennedy. He served one term Governor of Massachusetts, choosing not to run for re-election in order to focus on the 2008 Presidential campaign. So, how do the two compare on key Conservative issues. Both candidates are Pro-life, want to see Roe v. Wade overturned, and believe that abortion legislation should be handled at the state level. Romney is against stem cell research saying that it is “…creating life for the purpose of destroying it.” Perry is not opposed to stem cell research, however he feels that the Federal government should not fund it. One major difference is the candidates’ religious choices. 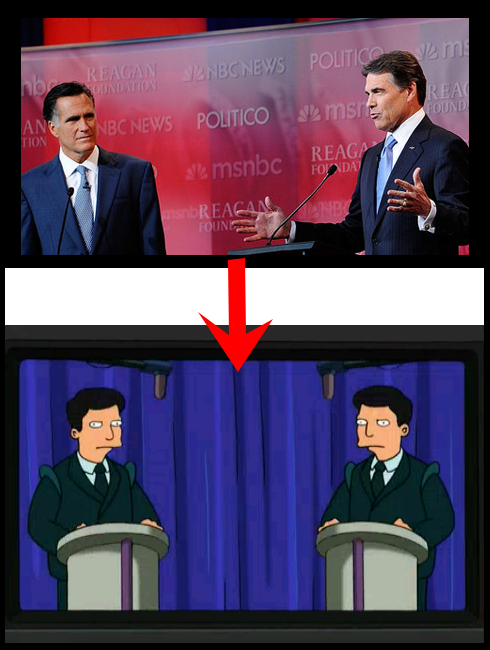 Romney is a member of the Latter Day Saints (Mormon) Church. Perry is a Christian Conservative who has held non-denominational prayer meetings. Some have said he wants to be pastor-in-chief. Perry points to the success of Texas as proof that his economic policies work. He pushed through tort reform, which is credited with causing out of state companies to move to Texas. He also points to the 265,300 jobs created in 2007/08. Romney is one of only two candidates to reveal a detailed economic plan. It includes a reduction in corporate income taxes, the repeal of “Obamacare”, and increased drilling for domestic oil. On immigration, the two agree on almost every point. The big exception is so called amnesty. Romney has said, “…any form of citizenship amnesty is troublesome.” As Governor, he vetoed a bill that would grant illegal immigrants in-state tuition to state universities. Perry has repeatedly stated that children of illegal immigrants should be given the full benefits of the Texas education system. As Governor, he pushed for in-state tuition for children of illegal immigrants.